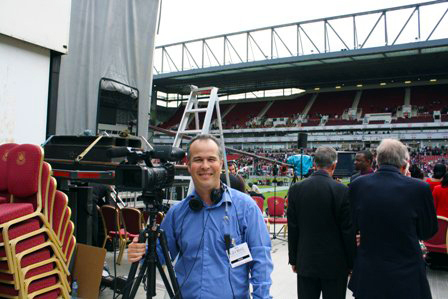 Peter Wooding (Media Missionary) is passionate about the gospel and serves with Mercy Projects in a dual role as both a media missionary and our UK ministry director. He spent five years as a YWAM missionary and has traveled the world for 22 years as a journalist reporting on the persecuted church and global ministry efforts. He worked as a sub-editor for the Chester Chronicle Newspaper and later became the news editor for UCB Radio, one of the largest Christian radio networks in the UK. During his 11 years with UCB, he reported from countries such as India, Gambia, Israel, Russia, S Korea, Mozambique, and Dubai. Peter Wooding also freelances for different ministries including CBN News, Leading The Way, and Samaritan’s Purse. He volunteers with his father, Dan Wooding, at ASSIST News Service and leads Mercy Projects teams to the Hearts of Love Center in Konotop, Ukraine. These duties mean that his cell phone rings constantly and he gets to serve the Lord with his passion for media and missions. His hobby is running marathons, having completed 22 to date, many of which he’s run to support the work of Mercy Projects. He lives in North Wales with his wife Sharon and three daughters. To contact Peter, please e-mail him at woodingpeter@hotmail.com, or by telephone at +44 7500 903067.